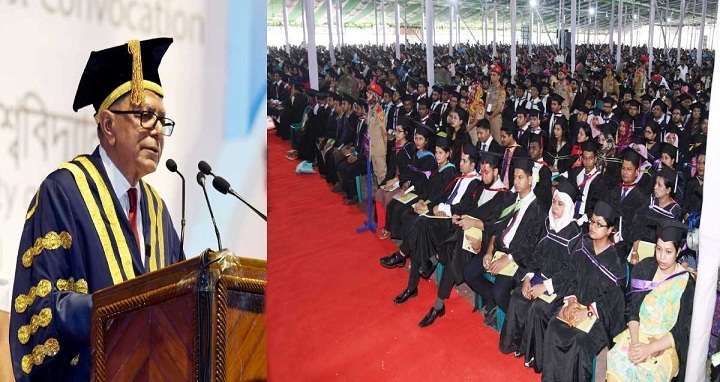 Dhaka, 6 October, Abnews: President Abdul Hamid on Saturday urged the students to play a strong role in nation-building activities as the struggle to build the country is yet to be completed. “The struggle for freedom has ended but the struggle to build the country has not…the country has not been completely freed from exploitation, deprivation, hunger and illiteracy. The pledge to build a society based on justice and equity is yet to be achieved. So, the young generation, especially the fresh graduates, have to lead the nation-building works from the front,“ he said. The President said this in his speech at the 51st convocation programme of Dhaka University held at its central playground. Referring to a statement of the Father of the Nation on the 30th January of 1972 at a ceremony, the President said Bangabandhu mentioned that the struggle to build the country is more difficult than the struggle for liberating the country. “Wherever you live in the world for life and livelihood, don’t forget the beloved motherland, don’t forget the people who had scarified their lives for liberating the country,” Hamid said. “University authorities, I think, will rethink about it in the interest of regular students. It should be kept in mind that it’s people who pay for the public universities. Therefore, you’ll have to give priority to their interests,” he added. “The contribution of this university (DU) in the movement for the development of Bengali nationalism, language movement, struggle for independence, Liberation War and democracy along with higher education and knowledge is unparalleled and unique. After the country’s independence, the responsibility of building the country was largely bestowed upon this university. Therefore, the university always plays the role of leader in fulfilling the aspirations of the nation,” he said. Mentioning that fruitful participation in creating world-class skilled human resources, innovative thoughts, research and innovation as the key challenges for universities now, the President said Dhaka University is very successful in tackling those challenges despite various adversities. Praisingthe graduates of the university, the President said the graduates of this university are playing leading roles in different fields of the country and have been contributing to the international arena, too. National Professor Anisuzzaman delivered his speech as the Convocation Speaker in the 51st convocation.